A south of Scotland local authority administration has announced it intends to make the maximum increase of 4.79% in its council tax this year. The Labour-SNP coalition in Dumfries and Galloway said it had "little choice" but to make the move. It said the council's funding gap totalled more than £16m and the action would reduce it as much as possible. 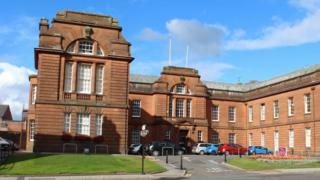 Councillors will meet on Thursday in Dumfries to decide whether or not to approve the budget proposals. The proposed rise in council tax would translate to more than £50 a year on a band D property. Council leader, Labour's Elaine Murray, and deputy leader Rob Davidson of the SNP, issued a joint statement ahead of the meeting. "This year's budget has been set in very difficult circumstances," it said. "Since austerity was introduced in 2010-11, Dumfries and Galloway Council has had to find cuts and savings in its revenue budget totalling £96m, equating to 27% of annual spend. "This year, we have had to make a further £10.2m reduction in expenditure." It said this year's funding gap totalled £16.215m. "In order to reduce the gap as much as we can, we have little choice other than to apply the maximum level of council tax increase permitted by the Scottish government of 4.79%, and to utilise the full health and social care additional funding offset permitted of 2.2%," the statement added. The council said its budget would focus on tackling poverty, with £1.375m allocated to a range of initiatives. New capital allocations would see £1m go towards improving roads and £338,000 to bring travellers' sites up to Scottish government standards. Earlier this week former council leader Ronnie Nicholson left the Labour group over plans to cut teacher numbers. However, the statement stressed the council would continue its policy of no compulsory redundancies with any job losses handled through early retirement and voluntary severance, redeployment and the non-renewal of fixed-term contracts.